His name as well as patronymic was Abul-Fatah and Gaisoo-Draaz his title. Among the scholars and theologians he was Sheikh Abul-Fatah Sadr Uddin Muhammad Dehlavi but people called him Khawaja Banda Nawaz Gaisoo-Draaz. He was the descendant of Hazrat Ali. His forefathers resided in Hirat. One of them came to Delhi and settled down here. Sheikh Muhammad was born here on 4, Rajab, 721 Hijri. 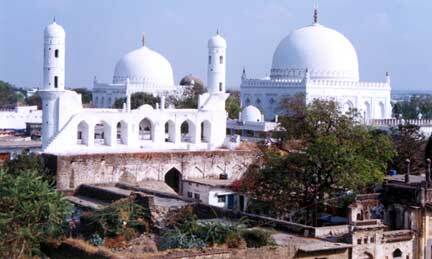 His father Syed Yousuf-bin-Ali alias Syed Raja was a holy figure and devoted to Hazrat Nizam Uddin Aulia. Sultan Muhammad-bin Tughlaq once transferred his capital to Daulatabad (Devgiri) and along with him went many scholars, theologians, and mystics. His parents also migrated to the place. He was four years at the time Malik-ul-Umar Syed Ibrahim Mustafa, his maternal uncle, was the governor of Daulatabad. From the very beginning his father put him on the right track i.e. to learn and to study and gave him his early education. From his childhood he was inclined towards Religion and spent time in meditation and prayer. He was ten when his father died and his maternal grand father assumed the responsibility of his education and training and taught him initial books but he took lessons on "Misbah" and "Qadoori" from another teacher. On the expiry of her father his mother grew angry with her brother, and returned to Delhi. He was fifteen at the time. He had heard a lot about Hazrat Nizam Uddin and Hazrat Nasir Uddin Roshan Chiragh Dehlavi from his father and maternal grand father and grew devoted to them. One day he went to say his prayer in the Jama-Majid of Sultan Qutub Uddin, there he saw Hazrat Sheikh Nasir Uddin Mahmud Chiragh Dehlavi and pledged Obedience to him on 16, Rajab. Under the guidance of Hazrat Nasir Uddin Chiragh Dehlavi he engaged himself in prayers and meditation and so much enjoyed them that lie forbade studies and requested his teacher to allow him to do so. Hazrat Nasir Uddin strictly denied him permission and instructed him to study with attention Usool-e-Bizoori, Risals Shamsia, Kashaf, Misbah so he restarted the studies under the guidance of renowned teachers. Maulana Syed Sheriff Uddin Kaithli, Maulana Taj Uddin Muqaddam and Maulana Qazi Abdul Muqtadir and qualified for the degree at the age of nineteen. Vallah khilaf-e-nest ki Uoo ishq baaz shud. (Meaning: "Syed Gaisoo-Draaz has pledged his obedience; there is nothing wrong in it because he has deeply fallen in love)." After this incidence he was entitled Gaisoo-Draaz. Hawa Asahi Quwwat-Ul-Qalb, etc. etc. Having lived for about 44 years in Delhi he went to Gulbarga. He was eighthly at that time. Firoz Shah Bahmani ruled over the Deccan during this period. He gave him much respect. For a long time he was engaged in religious discourses, sermons, and spiritual training of the people. This great scholar, mystic, and the wonderful, guide attained an age of 104 years, died on 16 Ziqa'ad 825 Hijri in Gulbarga and buried there. His tomb is a place of pilgrimage for all the people, high as well as low. If a Salik prays or meditates for fame, his is an atheist. If one prays or meditates out of fear, he is a cheat and a hypocrite. So long as a man disengages himself from all the worldly things, he would not step into the road of conduct. Divide the night into three periods: in the first period say Darud and recitation; in the second sleep and in the third call His name and meditate. The Salik should be careful in food it should be legitimate. The Salik should abstain from the company of the worldly people.